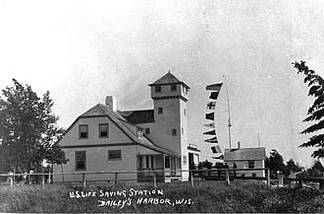 In 1867, the Inspector for the 11th Lighthouse District reported that Baileys Harbor was the only harbor refuge north of Milwaukee and that the approach to the harbor was marked by the Baileys Harbor Light on the east side of the harbor. It was also reported that the numerous shoals at the harbor’s entrance made navigation difficult during the day and almost impossible at night. To correct the situation, the Inspector recommended constructing range lights on the west shore of the harbor to make entrance into the harbor easier and safer. On July 20, 1868, the Federal Government appropriated $6,000 to build the range lights. A Lighthouse Board construction crew worked on construction during the summer and fall of 1869. The crew constructed a seven-room keeper’s dwelling which contained the rear range light. The dwelling was a 36′ x 24′, one and one-half story structure with a porch in front and a rear shed-roofed room for a kitchen. The rear range light’s rectangular tower projected from the roof at the front of the gable end of the house. On the south side was a large window behind which a 5th order made in Paris, France, was placed. The lens exhibited a fixed white light. Nine hundred feet down the range to the south, the crew erected the front range light. 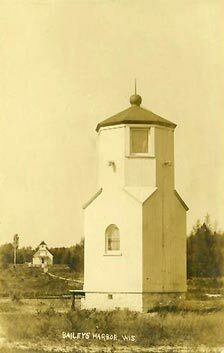 The square white painted tower was approximately 8 ‘x 8’. At a height of 12′, the corners of the tower were cut back to form and octagonal lantern room. On the south side of the lantern room a 22″ x 30″ inch window was placed. It was through this window that a steamer lens exhibited a fixed red light. Directly opposite this large window was a small rectangular window which faced the dwelling. This window allowed the keeper to monitor the operation of the front range light without actually having to walk to the front tower. Fabian Trudell, the first keeper, officially put the range lights into operation with the opening of the 1870 navigation season. Sailors were instructed to sail into the harbor keeping the white light directly over the red light. Among the early keepers was Joseph Harris, Jr., the son of the editor of the Door County Advocate. The elder Harris was the main promoter of a ship canal that would connect Green Bay with Lake Michigan via Sturgeon Bay, and which, ironically, would reduce the bustling shipping activity in Baileys Harbor to almost zero. Because the keepers lived only one mile north of the center of Baileys Harbor, they and their families were active participants in village activities. In 1896, the Lighthouse Board transferred Henry Gattie to the station. Gattie had the longest tenure of any keeper there, and he and his wife, the former Eva Hendrick of Baileys Harbor, made the range lights a popular destination. In 1897, the front range light’s original equipment was replaced with a 5th order locomotive headlight and a parabolic mirror to provide a more effective light. Change came to the station in September 1923, when the range lights were converted to an unmanned acetylene gas system. During this same month Gattie was transferred and the buildings were closed, shuttered and locked. At that time the Cana Island keepers became responsible for the operation and maintenance of the range lights. In 1930 lighthouse crews converted the range lights from gas to electricity. The same year, Immanuel Lutheran Church of Baileys Harbor received permission to use the empty keeper’s dwelling as a parsonage. The Bureau of Lighthouses in 1934 gave the Door County Park Commission permission to occupy and use most of the station’s land for park purposes. To prevent the destruction of this unique geological and botanical area, The Ridges Sanctuary was organized in 1937. In 1956 the Church gave up the dwelling and then Ruby Galke (Anschutz) lived there with her two children. She paid the Coast Guard $15 a month rent and had to be licensed by the Coast Guard so she could change the lights when they burned out. She lived there from 1956 to 1962 when she remarried and moved out. In 1965 the Coast Guard leased it to the Ridges. In November 1969, Coast Guard personnel removed the lighting equipment from the range lights, replacing them with a directional light on a metal tower south of the front range light. Thus, after one hundred navigation seasons, the range lights that had guided mariners safely into Baileys Harbor were permanently extinguished. The front and rear range light buildings remain, however, reminding visitors of the days when the faithful keepers tended their lights.